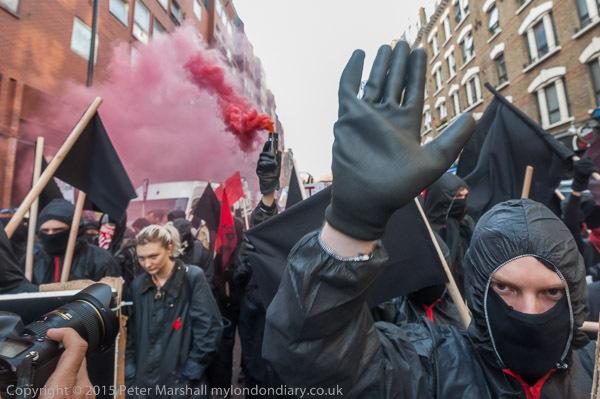 The so-called ‘museum’ dedicated to Jack the Ripper in Cable St – a tacky attraction for the strong-stomached tourist lacking in humanity or sense – received a couple of visits in November from protesters which I photographed. 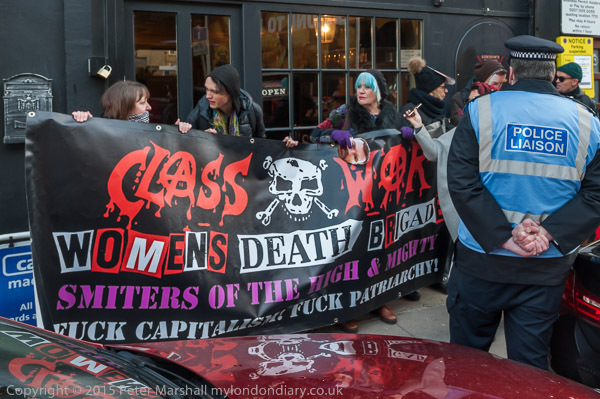 Class War were one of the first groups outraged by the shop to get organised, and I photographed their protests outside in August (here and here) as well as one organised by Fourth Wave: London Feminist Activists in October. 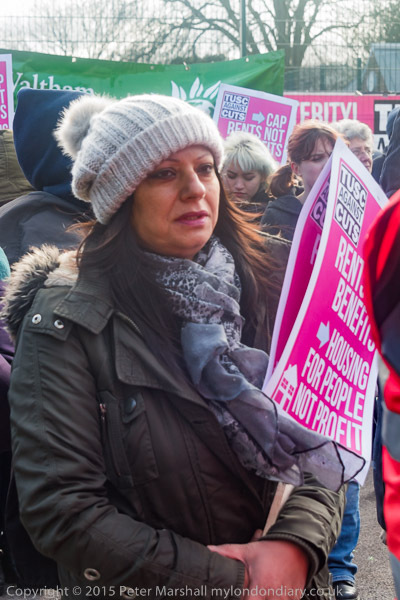 There have been other protests that I’ve either not been able to attend or only heard about after the event – particularly those organised by local groups. 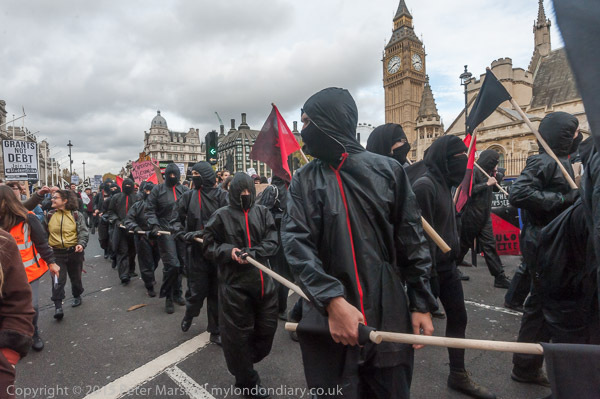 Class War were back again on a Saturday morning, several of them wearing masks showing the face of the museum owner, and stood outside the shop with their ‘Womens Death Brigade‘ banner. It was a small but noisy protest, watched over by a couple of police officers who seemed quite amused by some of Class War’s comments. He had to go inside the shop to talk with the proprietor’s partner who was behind the counter and ask him to stop dialling 999 repeatedly as the police were already here. 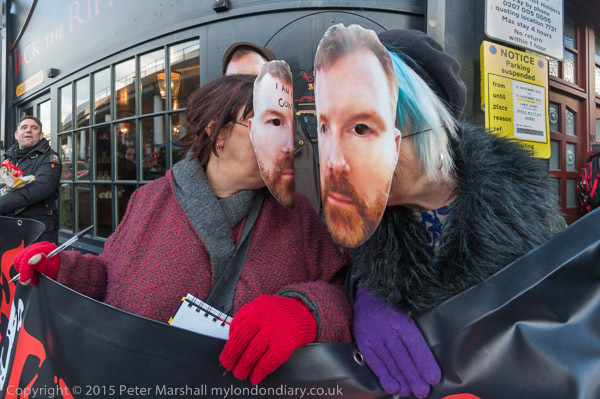 He – and perhaps his assistant – were obviously unnerved by the protest, which appeared to have disturbed what otherwise would have been a rather lonely morning – the door to the shop was open until he decided to lock it, but I think there were no customers during the hour or more of protest. Clearly it doesn’t appear to be a viable business, despite quite an effort on the PR side, including some obviously false comments on online review pages, and a man who came along to complain at the protesters. 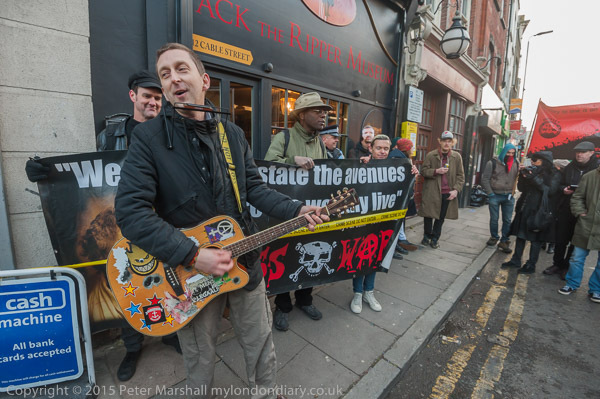 Rather more welcome was anarcho-folk singer/guitarist Cosmo, who came from Cardiff to perform some of his great songs at the event. After which Class War decided it was time time for the pub, and for once I had the time to join them, though I didn’t stay long as I needed to get home and process and file the story. 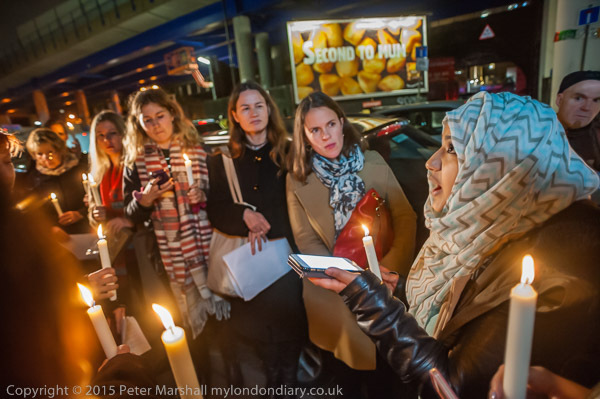 Five days later I was back at the same place for a protest with a very different feel, a candlelit vigil organised by the local Church of England and supported by the Theology centre at St George’s and London Citizens’ Whitechapel HQ as well as various women’s groups. There were one or two people present who had been there the previous Saturday, but it was a very different group, and included the great-great-great granddaughter of Catharine Eddowes , one of the Ripper’s victims. Photographically it was considerably more challenging, and something that would have been virtually impossible on film. Using the D700 I was working by candle light at ISO 3200. It was fine for people actually holding candles, but the light from them follows the normal inverse square rule for point light sources, and away from the candles it was dismal. 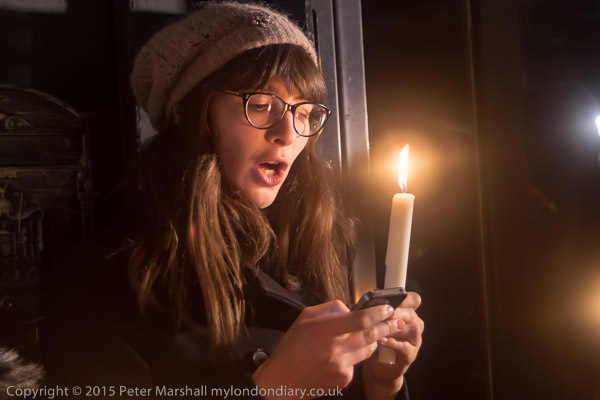 A woman holds a candle as she reads from her phone about one of the victims of Jack the Ripper outside the ‘museum’ which celebrates his vile murders. A photographer working for the local paper was also present, and did use flash, but he took considerably fewer pictures than me. But when the cleaner who had been working inside the closed shop came out, and was photographed, he responded by shouting ‘Don’t take my photograph!’ and lunged at the photographer, grabbing his camera and assaulting him. Without having flash on my camera, my pictures of this event were too blurred to be of use, but I’d had a clear view of what happened from several meters away. Police jumped out of the van where they had been sitting and threatened to arrest the photographer rather than his assailant! I and others volunteered to act as witnesses, but the photographer concerned declined to press charges. After the vigil, when those taking part walked together to the local church I did take some flash exposures. By this time I was late for dinner and had to rush off before the service began. 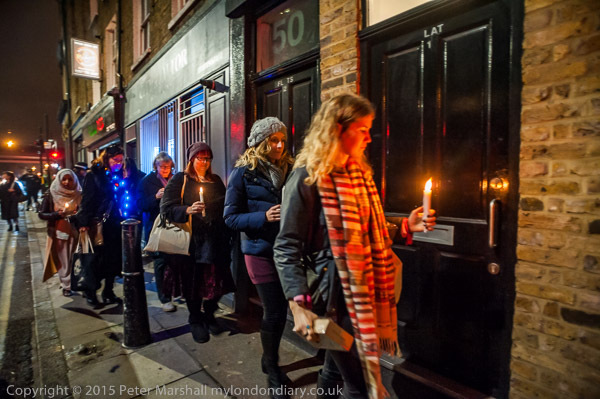 More text and pictures at Class War at the Ripper ‘Museum’ and Ripper ‘Museum’ Candlelit Vigil. 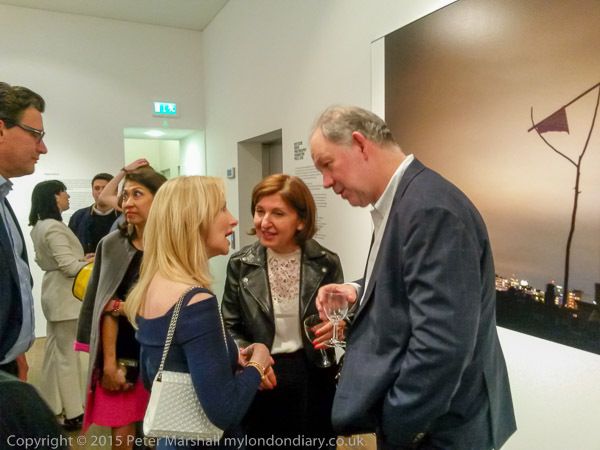 I missed one event entirely from the list on last November’s ‘My London Diary‘ page. 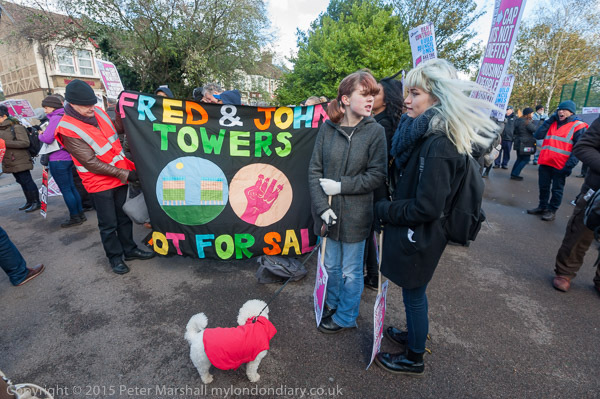 Homes for All against social cleansing was present in its correct place if you scrolled down the page, but I’d failed to add it to the index at the top of the page. It’s easy to do. All the code that runs this site is hand-crafted html, though written with the help of an ancient version of Dreamweaver, which does a nice job of looking after it and making life easier for me. It allows me to look at the site as a whole, and will search and replace across a file or a whole folder of files, and handles some of the actual coding, though I spend quite a lot of time in its ‘Code View’, because it’s easier to do some things that way. People, particularly some web designers, look at me or sometimes actually tell me I’m mad to do it this way, or show disbelief that a site of this size – now over 150,000 images – can be organised this way. I probably am mad, but it remains the easiest and quickest way to do it. I started writing html in 1995, and more or less kept up with the changes , including converting my sites to use CSS. Several times I’ve played around with using designs based on data bases but never yet found anything that would give me the speed, flexibility and ease of plain old html. Partly it is down to site design. I played around with this site for the first few years, and it was only after around 6 years that I finally came up with the current design (though there have been a few minor tweaks since then.) But the main reason is that what takes the great majority of the time is actually writing the captions and text which I think are essential to accompany the images. November 21st last year was a cold and windy but sunny morning in London. Clear air and a low sun gave me some problems with exposure because of the high contrast, and exposing to keep details in the highlights left Lightroom a lot of work to do to bring up details in the shadows. Although I had the ISO set to 800, some of the darker areas show the kind of blotchy colour patches that are more normal at perhaps ISO6400. The images are also rather grainier than normal, though perhaps I could have been more aggressive with the noise reduction. NR is one area of LR which could do with some improvement, and third-party add-ons such as Dfine – now available free as part of the Google Nik collection – can significantly improve images. But using this takes too long (and takes up too much disk space) for it to be a part of my normal workflow. Things like the small dog in a red coat in the picture above help in making pictures that otherwise can too easily look like any other protest rally. Of course the people are different, though there were quite a few present I’d photographed at other protests, and this was a new location. But it wasn’t a very inspiring location, a rather scrappy area of asphalt at the entrance to a small park. Making images got a little easier once the marchers left the park and came out onto the road, though as you can see above the sun was still causing problems. Lens hoods on wide-angle lenses like the 16-35mm are not really a great deal of use. The sun was only just out of image at top right, and there was considerable flare and ghosting in that corner, as well as across the frame, with a neat rainbow on the roadway at bottom left. Although sometimes such effects add to an image, I didn’t feel they did in this case. I’ve done a little burning in on local areas, increasing contrast and clarity and reducing the highlights to make the effects less visible. Sometimes cutting down the saturation helps too. This was an image taken from a high viewpoint, holding the camera well above my head and hoping – and wishing I was using the Fuji X-T1 or some other camera with a tilting screen. I sometimes use the camera’s live view while taking overhead images like this, but it is really difficult to make out anything on the rear screen in bright light. ; cupping the left hand around the top of the screen slightly restricts reach but does make the screen a little more visible. When using the camera at eye level, I usually add my left hand on top of the lens hood when the sun is close to the frame edge – and usually find I have to crop a little of it out at the top of the frame, but at least it does produce a reasonably effective lens hood. 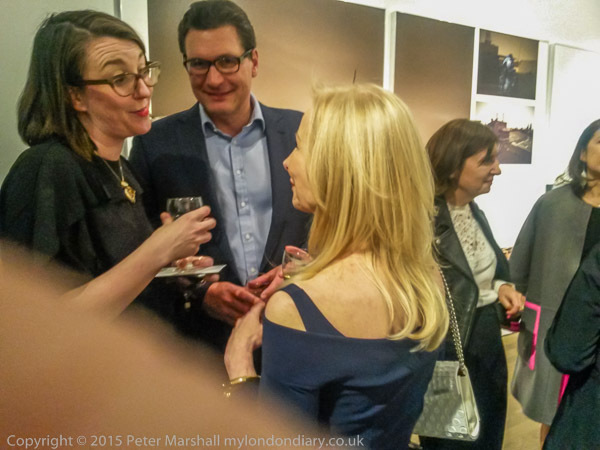 But sometimes my hand – or other objects – can get out of hand, as in what is one of my favourite frames from the event. Whatever it was, it wasn’t meant to be there, but I don’t think it entirely spoils the image. 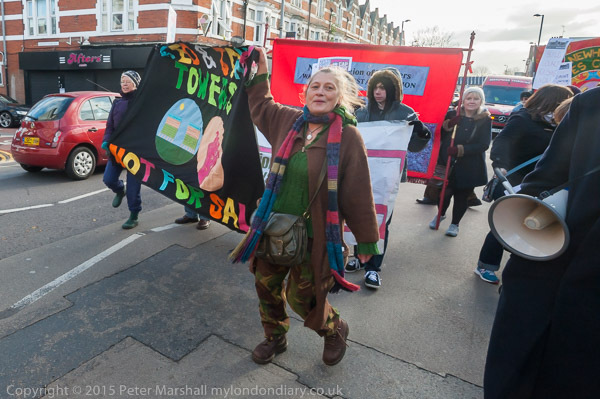 I was walking backwards fairly close to the woman with the placards, with the 16-35mm on the D700 at 16mm and things get just a little tricky to manage. This was the last of several frames I’d taken of her, and the previous few frames I’d been a little further away; while that makes life easier, it also reduces the impact of the image. 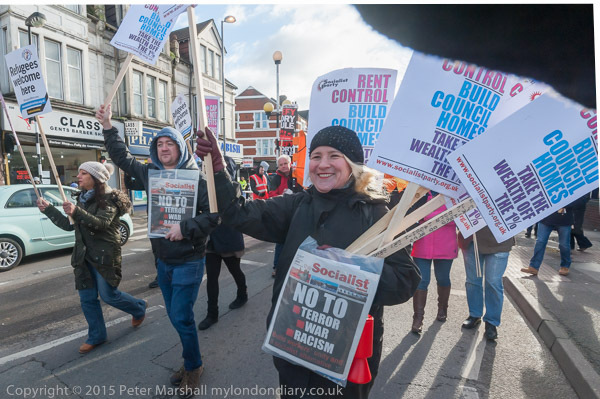 Text and more pictures at Homes for All against social cleansing. Partition of India back in 1947 was a bloody business, and one that continues to have many bloody repercussions, not least in the Bangladesh Liberation War in 1971, which was the subject of an earlier show curated by Shahidul Alam (with Mark Sealey) ‘Bangladesh 1971‘ at Autograph ABP in Shoreditch, London, in 2008. Although the great majority of the population of Bangladesh are Bengali, some areas of the country have considerable numbers of indigenous peoples, notably in the Chittagong Hill Tracts (CHT) in the south-east, bordering Myanmar and India, where they form roughly half of the population. Collectively known as the Jumma, the largest ethnic group is the Chakma (also known as Pehari) people. Unlike the Bengali majority who are largely Muslim, the indigenous people are mainly Buddhists. Lord Mountbatten, sent as Viceroy to India to oversee independence and partition, was so concerned over the Boundary commission’s decision to include the CHT in East Pakistan that he delayed announcing the commission’s decisions until the day after Independence Day as he feared it would provoke a powerful reaction, with boycotts of the celebrations. After independence the Bangladeshi government have attempted to solve the problem by settling the area with Bengali people, and the hill tribes set up a resistance movement with a guerilla force (encouraged covertly by India) which launched an insurgency in 1977 and the area became highly militarised, with government forces and paramilitary groups carrying out atrocities including mass rapes, genocide and ethnic cleansing. Kalpana Chakma “was a vocal and charismatic leader who campaigned for the rights of the indigenous people” of which she was one, and had become leader of the Hill Women’s Federation, speaking out against the military occupation and handing out their land to Bengali settlers. She was only 23 on 12 June 1996 when, a few hours before voting began in a national election in which she had been campaigning for an independent candidate, Lieutenant Ferdous and other members of the Bangladesh Army raided her family home and abducted her and her two brothers. Attempts to report her abduction and get information from the army and police were refused, and continuing attempts to get at the truth about what happened to Kalpana Chakma have been met with deliberate lies and obfuscation. 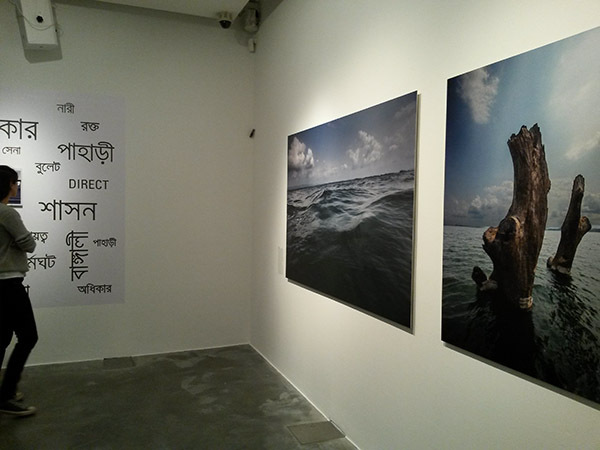 Shahidul’s work in ‘Kalpana’s Warriors‘, curated by him together with Rahnuma Ahmed, Saydia Gulrukh, Dadia Marium and ASM Rezaur Rahman is an attempt to ‘break the silence surrounding her disappearance‘ but is also a powerful celebration of her continuing influence on political activists, the ‘warriors’ who have fought to demand the truth about her abduction and to obtain justice, as well as a candlelit vigil in her memory. It’s probably best to visit part two of the exhibition first, which contextualises the work with images which show something of the area and the movement of which Kalpana was a part. A film made by Alam shows a number of people talking about Kalpana and her influence, with English subtitles, and at 35 minutes it seems a little slow-moving.But this is a general problem with subtitled interviews in that you can read in a second what perhaps takes 15 seconds to say, and then have to wait impatiently for the next sentence. 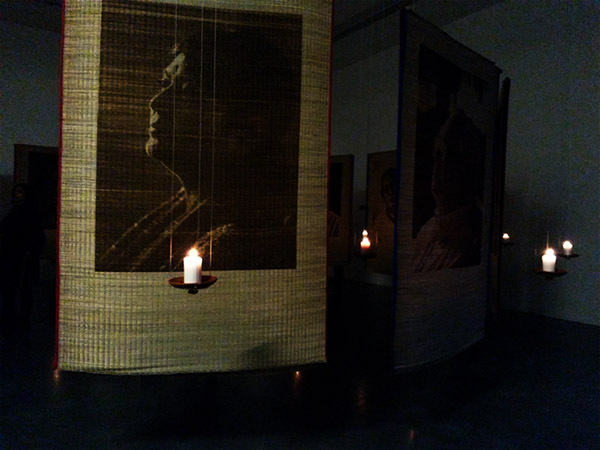 The installation in the ground floor main gallery is impressive, with large images, heads and shoulders at much greater than life-size etched on straw mats, each illuminated by a single hanging candle. It was getting dark outside when I walked around it, and it might be just lose a little during daylight hours with more light leaking in from outside. The straw mats are like those found in the village homes in CHT, and on one of which which Kalpana would have been sleeping when the soldiers came to take her, and the technique used to print on them also reflects the realities of life for her and her people. Before her abduction she had been leading protests against the burning of Pahari villages, and the images are burnt onto the mats using a laser beam. There are smaller 4×3″ more conventional prints in small piles against the wall around the installation which you can pick up and take away, with short texts on the reverse naming and describing the ‘warriors’. The installation with its hanging mats in a circle which you can walk around both outside and inside is an experience with a highly religious feel to it, like entering a temple. Even on the opening night when it was relatively crowded – with numbers strictly limited to 30 inside the installation for health and safety reasons and many were using their phones to take photographs – it had a powerful atmosphere, and I think this would be more so on a normal day when it was quiet and empty. 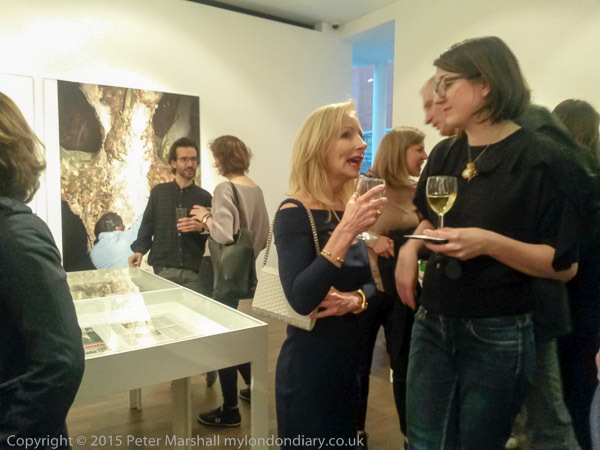 It’s a show I recommend highly, and Kalpana’s Warriors continues at Autograph until 18 June. Media and copyright lawyer Rupert Grey wrote a very detailed review of Shahidul Alam’s fine book ‘My Journey as a Witness‘ which includes a great deal about him as well as some pictures. You can also see videos on Vimeo and others on YouTube. You can see more work at Alam’s web site and he posts regularly on the ShahidulNews blog. I’ve often written about my love for the fisheye lenses, the type that give a 180 degree view across the image diagonal, filling the whole frame with the image, first the Nikon 10.5mm for DX format and latterly the 16mm FX; both light and reasonably fast at f2.8. I use them when I want or need to work really close to the people I’m photographing, particularly in crowds and also for panoramic landscapes, usually with little in the close foreground. Where they seldom if ever work is at moderate subject distances. Both lenses need a little help from software, and Lightroom (or Bridge or Photoshop) do a great job of removing the colour fringing which is otherwise rather pronounced on large prints. When I first started using the 10.5mm it was sometimes a problem, and reducing its effect in old versions of Photoshop something of a trial, involving careful selection by colour and desaturation. Now it’s automatic and does a much better job. Also the curvature due to the spherical fisheye perspective is usually a distraction, and software that converts to a cylindrical perspective which gives straight vertical lines is often essential. Photoshop offers to correct it to rectilinear, but that only works if you are willing to accept a narrower horizontal angle of view and a definite softness at the image corners. Rectilinear images are really limited to a horizontal angle of view of around 90 degrees, while the fisheye covers around 147 degrees. Just occasionally I take an image that – at least for me – works well without that conversion. If you are a photographer you probably noticed that the image above was taken with a fisheye; but to the ordinary viewer it just seems a ‘normal’ image. And I want people to look at the pictures and not have problems with them seeming unnatural – I try hard to avoid a ‘lensy’ look, whether from ultrawide or extreme telephotos. 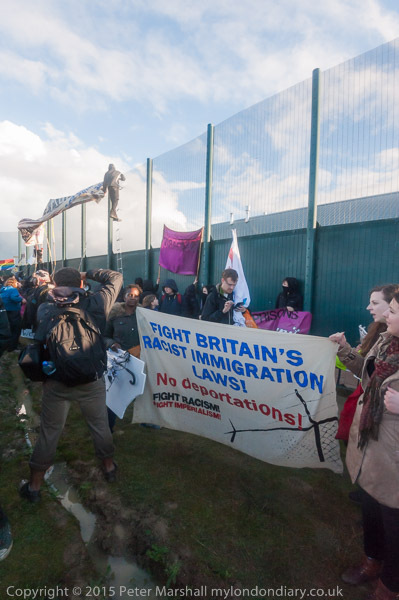 The picture was taken as protesters held a rally on the road close to Yarl’s Wood, one of the UK’s detention centres where we hold people seeking asylum indefinitely, sometimes for 18 months or more, treating them as criminals rather than as refugees. Yarl’s Wood is miles from nowhere, 5 or so miles north of Bedford on the edge of an isolated business park on a former WW2 airfield. 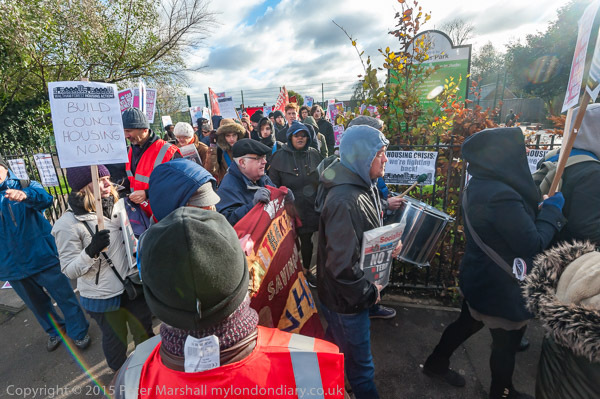 The protesters come mainly in coaches and form up by the side of the road to march the three-quarets of a mile or so along a footpath to a field adjoining the prison. Once we were outside the prison, it rained, or rather poured, as you can see in some of the pictures. I got out my umbrella, which kept the worst of the rain off my cameras but they still got wet. I got wet too, and the ground got wetter still. Down by the fence, against which much of the action was taking place, the mud got muddier, with water filling furrows running through it. It got hard to move around at any speed, walking on the filthy greasy surface, struggling to keep balance. Fortunately the rain was a brief shower, or rather a series of brief showers, with the sun coming out between. But I was getting covered with mud just trying to move around, though fortunately kept my balance, though I saw a few others falling over and getting plastered with mud. There is a slope in the field going down to the fence, and also a ditch which is just wide and deep enough to be difficult to cross, but not impossible. Hard to jump with camera gear and a muddy landing on the other side, though at one point the protesters had put down a pallet to act as a bridge. From higher up in the field we could see and wave to the prisoners inside, many of whom were holding up notices to the windows, clearly delighted to see there were people who knew what was happening to them and cared about it. Even the sun caused problems for photographers, making it difficult to photograph the people putting banners up on the fence from some angles – except when the clouds came over again. From higher up the hill, we could see some of the women holding things at and outside the windows, which will only open a couple of inches. One banner read banners ‘We came to seek refuge not to be locked up‘ and another ‘We are from torture we need freedom‘. Others wrote their phone numbers on sheets of paper so that the protesters could contact them and relay their messages over the public address system they had brought. I didn’t have a very good day there. I was very unsteady on the mud, and had forgotten to bring my 70-300mm lens which would have been rather more useful for photographing people at the windows than the 28-200mm. Photographing through the wire fence is a pain too, with autofocus struggling to get the window frames rather than the wire fence sharp – and modern lenses are not good for using manual focus. And as I walked away I realised that I’d lost my umbrella. I stayed for a couple of hours and was then pleased to walk away, and find somewhere to scrape the worst of the mud off my boots, which weighed several times as much as usual. It was several days later that I finally got rid of all the mud. 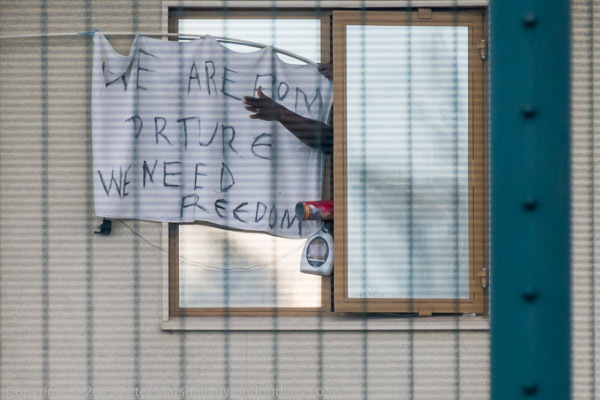 But the feeling of shame that my country could treat people seeking asylum like those locked up at Yarl’s Wood can’t be washed or scraped away. 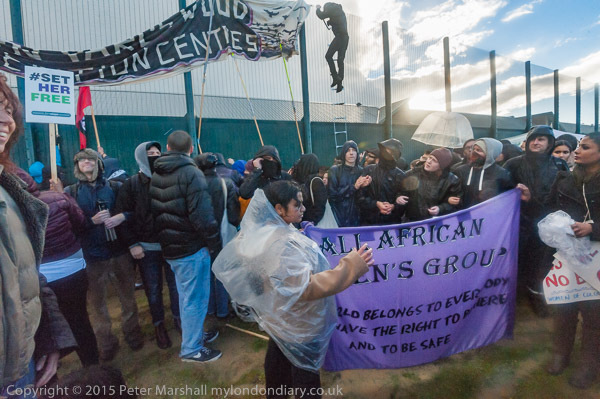 More pictures at MFJ Meet Outside Yarl’s Wood and MfJ ‘Set Her Free’ protest at Yarl’s Wood. 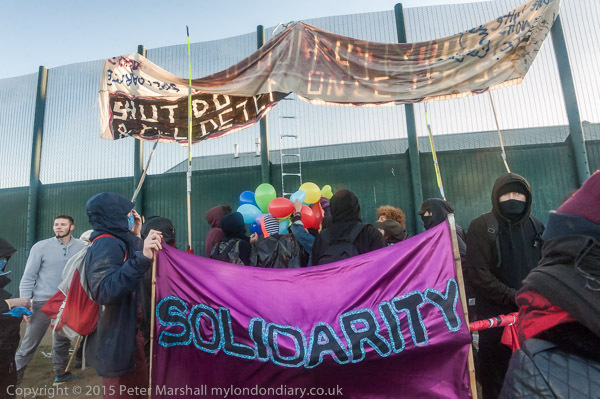 I’ve been back with the protesters to Yarl’s Wood since Novemeber, and another protest is planned there and at other detention centres around the country on May 7th, 2016. 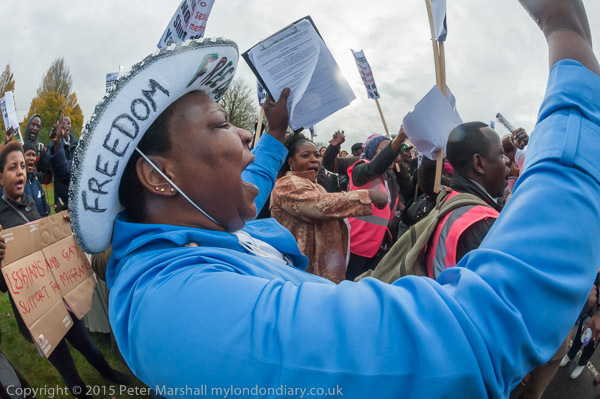 More details of this and other protests from Movement for Justice. 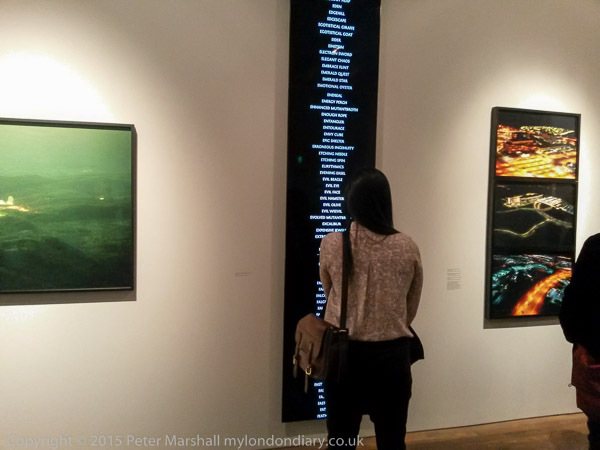 I don’t know how many art galleries there are in London. 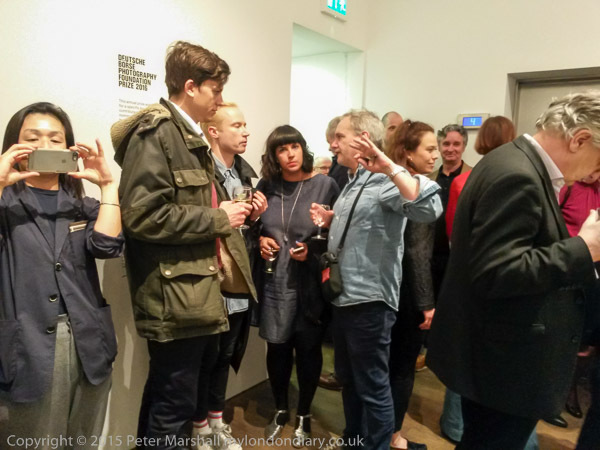 Tate Britain, Tate Modern, National Gallery, Courtauld Gallery, Dulwich to name just a few, but there are relatively few photography galleries – and most people might struggle to name even one. Of course there are art galleries that show photography at times, and even places like the V&A that have a tiny bit of space devoted to photography. And London is of course home to what the Arts Council England have called their flagship photography gallery,the Photographer’s Gallery,and like many photographers I regard its lack of commitment to photography as a scandal; for most of the time it’s just another art gallery, if one that specialises in art related to lens based media. It wouldn’t matter if England had a plethora of photography galleries, but with so few it seems almost criminal that when so little of the the AC’s money actually goes on photography what little it does provide doesn’t really go on photography rather than on conceptual art. Of course it isn’t just London. We almost got a national photography gallery up in Bradford – never a good location, Birmingham would have been a far better choice. Or Manchester. Or Leeds. Or Sheffield. But even that promise more or less ended a few years back, with the final stab in the back being the decision to move the RPS collection to the V&A. And too often that conceptual art which relies so strongly on photography is weakened by doing so. It seldom gives rise to good photography, perhaps because generally the concepts are so simple and so readily grasped that photographs are really superfluous, often little more than rather boring records. There have certainly been exhibitions at the Photographer’s Gallery that would have been preferable visually without the pictures. This is something perhaps epitomised by the current Deutsche Börse Photography Foundation Prize, with work by the four shortlisted on show until June 26th 2016. 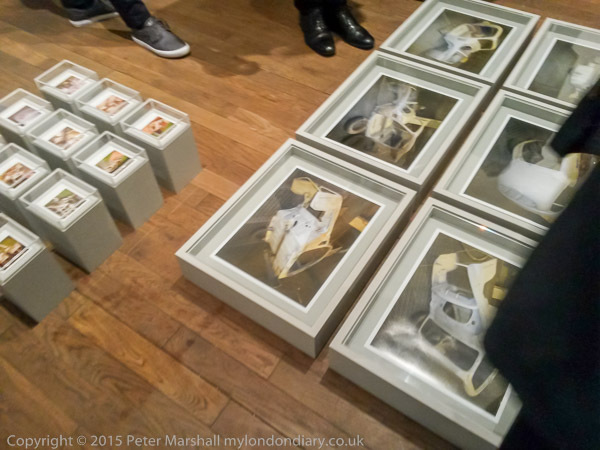 There is relatively little in the show to interest photographers or lovers of the photograph. 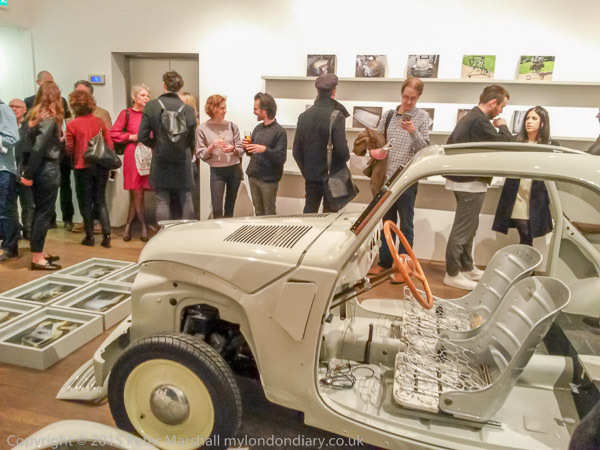 There are a few fine images by Laura El-Tantawy, and some highly competent but slightly pedestrian images by Erik Kessels, the main feature of whose show is an old Fiat. Even El-Tantawy’s work is disappointing here, at least for those who know her book* or web site ‘Shadow of the Pyramids‘; the work as seen here seem much like a a pale shadow of the book. Despite this, to my mind it stands fully a head or two above the others, but I suspect she will not be the winner. The DB Prize really isn’t about photography or photographers at all; Ben Luke ended his short review in the London Evening Standard with the phrase “Paglen is the best artist here“. The question isn’t who is the best photographer. 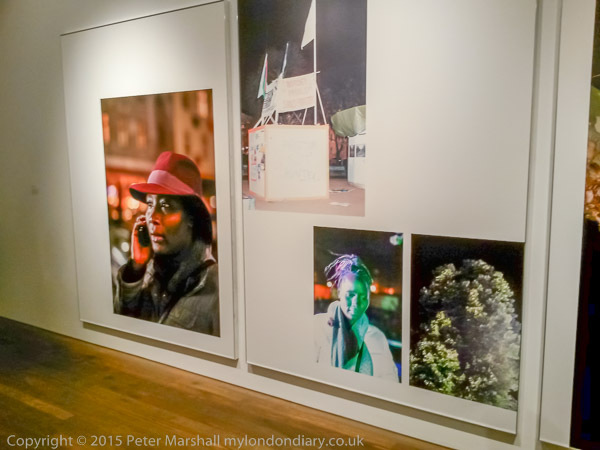 I got out my phone during the opening and took a few snaps in the two galleries containing the work. I still haven’t really worked out how to use it and got quite a few pictures of my feet as well as what I was trying to photograph. The light in the lower of the two gallery floors housing the ‘installations’ was pretty dim and quite a few images were unsharp, but most were OK. The camera on the Samsung Galaxy S4 mini isn’t the best around, but does a fairly good job, and with a little help from Lightroom- noise reduction in particular – the results look pretty much OK on the web. Looking at the EXIF, all seem to have been taken at 1/35s f2.6 with the ISO varying from 320 to 800. For what its worth the focal length was 3.7mm, which appears to give a horizontal angle of view similar to a 30mm lens on a full-frame camera. Although the camera is said to be 8Mp and gives images 3264×2448 pixels, the images are curiously bereft in detail, giving similar image quality to my first digital camera which only had around a 2Mp sensor. * I bought the book pre-publication at a discount. When I wrote my post about it here recommending you buy it, copies were still available at 88.60 Euros; now you can buy it through dealers for around £300 and you can expect the price to keep rising. I don’t often give good financial advice:-). I have a slight problem with language. Or rather I don’t really have a problem with it, but some other people do, and they get offended by seeing some of the slogans on posters and placards. I don’t like to offend people gratuitously, and I was pleased to be able to find a viewpoint when making this photograph which obscured a vital letter ‘F’. And though it doesn’t worry me, I normally use asterisks in captions and articles to avoid offending others with words such as f**k. Though myself I feel more offended by issues such as poverty and homelessness than in language that is a part of normal speech for many. At heart I think it’s a class issue, and I’m much more upset by class prejudice than by swearing. 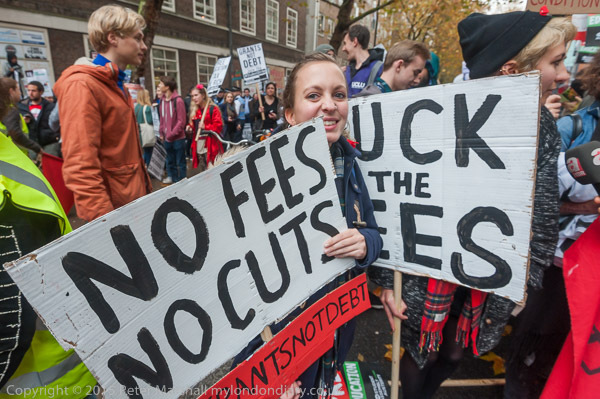 The protest for free education with its slogan ‘No Barriers, No Borders, No Business‘ was certainly a good one for placards, with a wide variety, including at least one in Latin. 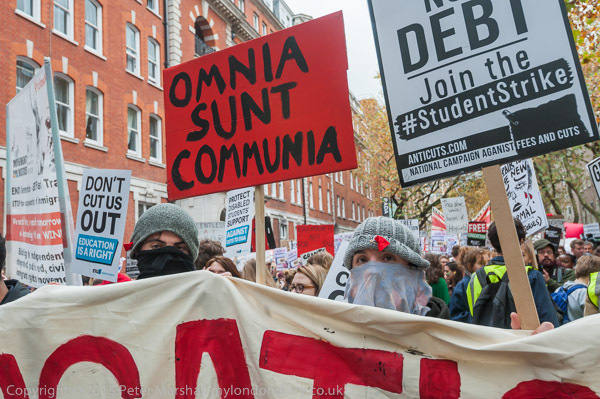 I was fortunate to have benefited from free education, which did for me include an O Level in that language, but probably even those without that advantage could understand the gist of this one, ‘Omnia Sunt Communia‘. But I did have to turn to Google to find that it was a phrase pinned by his torturers on reformation theologian Thomas Muntzer who led the German peasants revolt of 1525. Fittingly for an education protest there was a ‘book bloc’, including here I couple I’ve read and including here two other authors I’ve photographed, though perhaps a shame that one of the volume titles includes a spelling error. 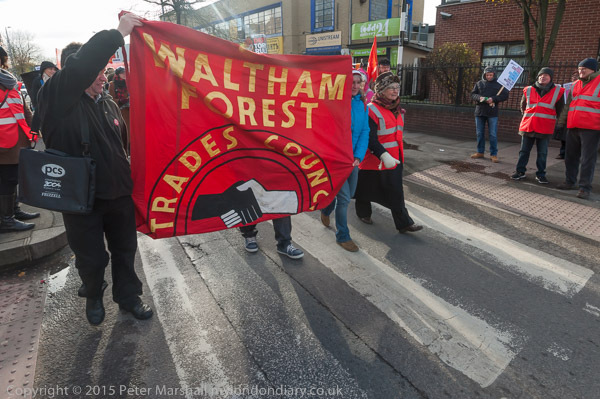 There were a few flares set off during the march, and something of a scramble by photographers to photograph them. 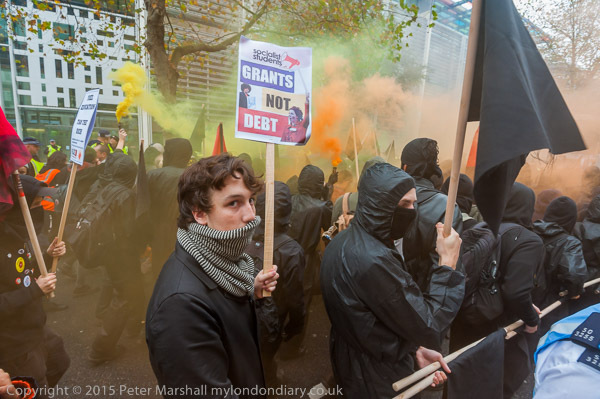 I didn’t get any particularly good pictures, though one was enlivened by a masked protester holding up his hand to try and block my lens – which made me widen the view of my zoom to include him. But mostly people were friendly and happy to be photographed. 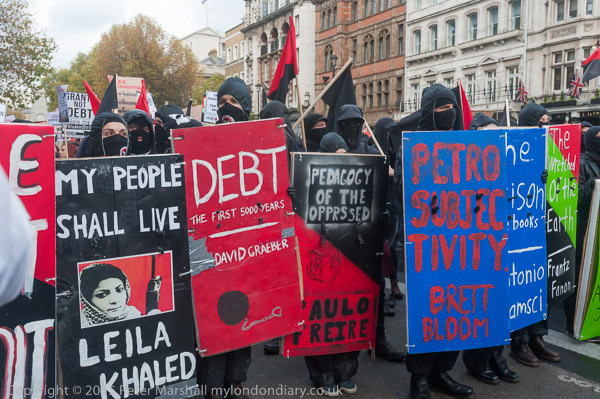 The ‘black bloc’ took on a more uniform appearance for the protest, most wearing identical jackets and trousers to make themselves rather less identifiable. But even so some were unhappy about photography. They were carrying black flags on sturdy poles and at times used them to restrict access to the bloc – as in the picture above. 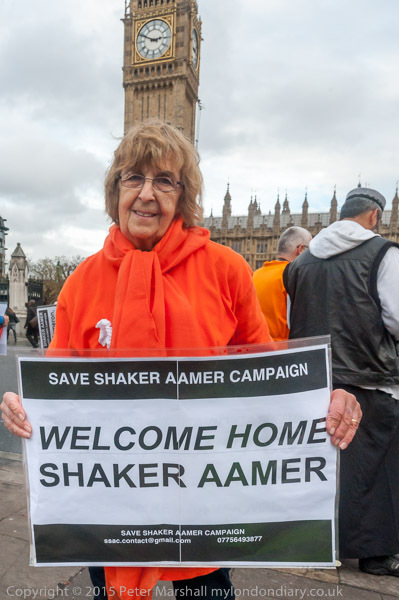 I left the march as it went down Millbank to speak to and photograph a protest that was also taking place along the edge of Parliament Square, where campaigners from the Save Shaker Aamer Campaign who have mounted a weekly vigil for his release opposite Parliament every Wednesday when Parliament was sitting were celebrating to welcome him home. There celebration was a little muted, as although he was the last British resident there, over a hundred men still remained captive. I shared their rejoicing over his release, and also as I photographer flet glad I would not have to continue photographing – at least occasionally their weekly vigils. 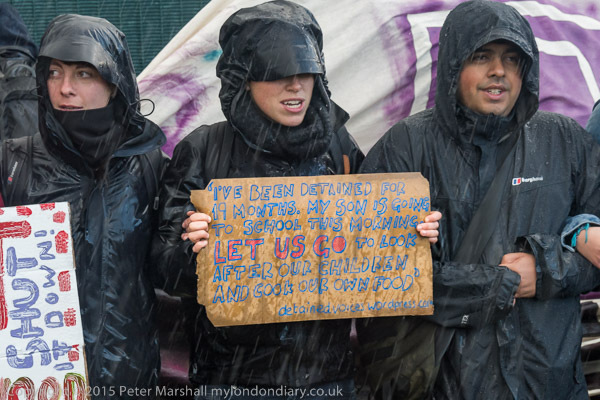 With similar protests on a regular basis it does become hard to say anything new, both in the text and the images. Protests against Guantanamo will of course continue, and I’ll still go to photograph them when I can, including the regular monthly event at the US Embassy. Here they made a fairly half-heated attempt to push through a police line, but were repulsed. Then a large group of police arrived and mounted a charge against the students, including many of those who had simply been standing and watching. I saw several photographers also being assaulted by police and got pretty roughly pushed to one side myself. The police regrouped and stood watching the students. More police arrived and formed a tight line across the street, kettling the protest. I decided I’d had enough, but had some difficulty as officers refused to allow me through the line despite showing my press card. I walked along the line and eventually found an officer who let me through, and walked away. I’d gone about a hundred yards down a side street when I heard a lot of noise, and turned around to see a crowd of students running, having broken through the police line. But I was tired, having been on my feet too long, and couldn’t face running after them – and continued on my way home. One of the main reasons I began writing a series of articles about World Photography around 15 years ago was the strength and vitality of photography that I had seen coming from Central and Latin America, and I decided that as well as writing about various other countries around the world I would begin to tackle the countries of that continent in alphabetical order. It was a task I never completed, and I think the last country before I was sacked (at least in part because of a determinedly international approach which made it harder for my employers to sell space to US advertisers) was probably Mexico – which actually got several articles. Other countries were much harder to find out much about, and one of the hardest was Chile, where I was able to find relatively little information then on the web, or in the libraries I had easy access to. It was the web that was vital, as I was writing for the web and needed to link readers to web sites they could visit to see photography. Probably an important part of the reason for the lack of information was the human rights situation, particularly in the 1970s and 80s which my article mentioned. The show currently at the Maison de l’amérique latine in Paris until the end of April, Faces cachées: Photographie chilienne 1980-2015, is called ‘Hidden Faces’, and none of my research on the web led to any of the photographers represented in it. The article on the site is in French, but Google translate may help if you have problems with that. There is more information about the photographers and more images in the press release. Lensculture has an illustrated feature on the show Hidden Faces: Chilean Photography, 1980-2015 with 9 pictures and text by Elizabeth Temkin, and also links to a documentary “La Ciudad de los Fotógrafos,” but once I found out how to turn on auto-generated subtitles made a little more sense, though at times they add an element of the surreal and some of the 1hr 20 minutes was lost on me. 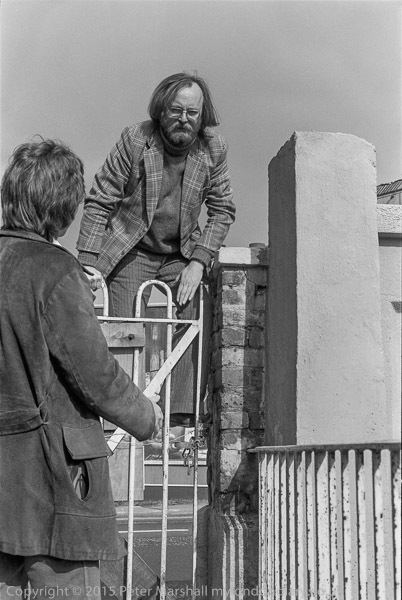 Way back in the mists of time – and 1979 now seems pretty misty in my memory, I took this picture of the late Terry King clambering over a gate with some difficulty. While another photographer, Robert Coombes, was going to help him, I simply stepped a little to the side to take the picture. It was a matter of priorities! We were on a Group 6 outing on a fine Sunday in May and I think we had probably caught the North London Line which at that time ran from Richmond to Broad Street station with some of the dirtiest trains imaginable with windows that had almost certainly never been cleaned since they were put into service perhaps 40 or 50 years earlier, and a peculiar musty smell. Terry was the organiser of our group, then at least nominally a part of the Richmond and Twickenham Photographic Society, though we later were forced to leave, and to change our group name to Framework. Although a fine photographer, making some exquisite gum prints (one of which still hangs on my wall) and a poet – you can see both aspects in his Beware the Oxymoron, he was an aesthete rather than an athlete, although in his civil service job before he went full-time into photography he had at one time had to clamber down somewhat rickety ladders to inspect tin mines. 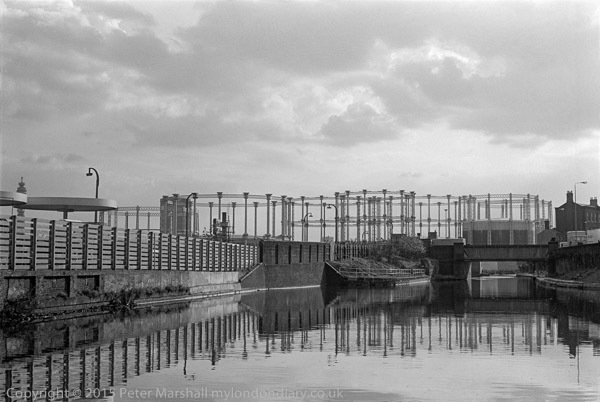 I think the canal walk had probably come from a suggestion by me, as a few months earlier I’d taken a couple of walks on my own along the Grand Union and would have brought some of the prints to show the group. As well as the visual possibilities I was excited by the way it cut an almost secret path through the city, and there were also strong connections with my then growing interest in industrial archaeology. But Terry knew the canals better than me and was the leader for this outing. 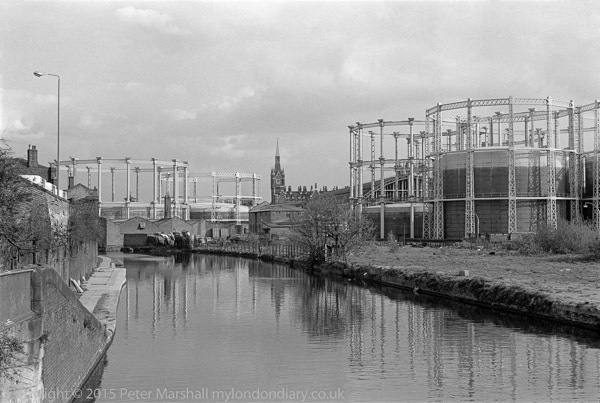 The canals were less well-known then, and also rather less used. Commercial traffic had more or less come to an end, and the leisure boating community was much smaller than it is now, and much less public, almost masonic. There were fewer people actually living in boats. I used occasionally to ride my bike along a tow path, and it was then illegal unless you had a permit, for which you had to pay; you had to keep an eye open and avoid the wardens. 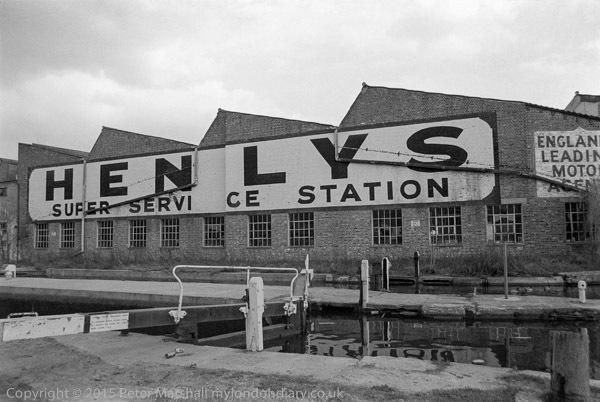 Later the British Waterways Board decided to make these permits free – and I applied for one straight away, and used it until permits were no longer necessary and the tow-path became free for all. On many London stretches it is now too much of a free for all, and just a small proportion of the cyclists who use it do so irresponsibly at speeds more suitable for a racetrack than a shared path. But our outings were not intensively planned. We had a meeting point and a rough idea of where we would go, and then wandered. It was a small but diverse group photographically and the handful – seldom more than five or six – who went on any of our meanderings had interests in different aspects of the subject matter and often very different equipment – from 35mm up to 4.5″ and later even 8×10″. 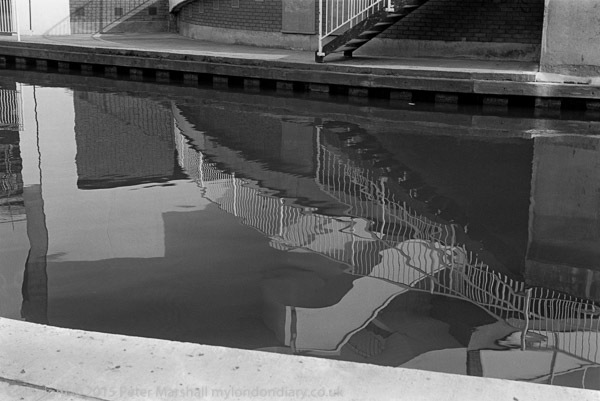 As a result of our lack of planning, when we got to the canal, we found it was closed. Not closed to boats, but the tow-path was closed, and the gates to it locked. Work was going on to put high-voltage cables under the tow-path. But it was a Sunday, and no-one was working, so we climbed over the gate and had the canal to ourselves to take pictures. We did have to walk carefully around some areas where there was a trench dug for the cables, but there was no real danger. Eventually we did come to a place where the tow-path became impassible, and worried we might have to walk back some distance to the gate we had climbed over, but fortunately a woman who was in her garden backing on to the canal came to our rescue, and let us in through her gate from the tow-path and through her house on to the street. She was cradling a young child, her grand daughter, and as we thanked her outside her front door, I asked if I might take a picture of the two of them and she agreed. Her friend was standing watching from the door step. 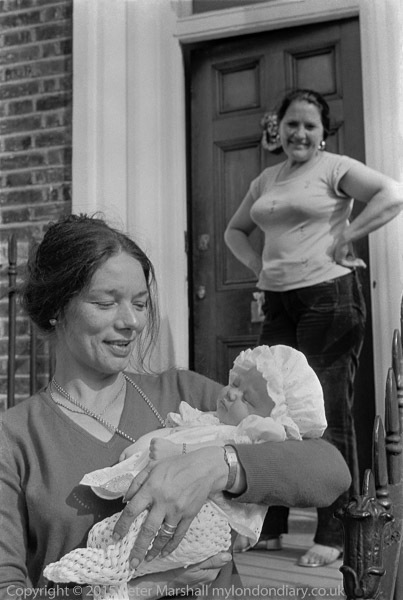 I didn’t photograph many people outside my own family at the time, and this remains an image that I like. A month or so later I tried to return to give her a small print, but either I’d remembered the address wrongly or they had moved. I think I went home and posted it, hoping it would be forwarded. 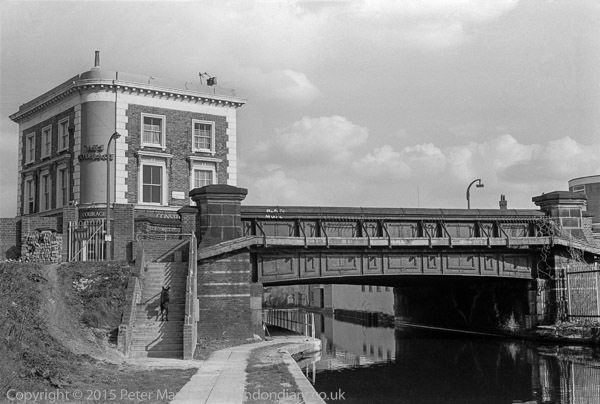 I’m working on these images in preparation for another book, of my walks along some of London’s canals back in the late 70s and early 90s. Probably most of these images will appear in the book, but I’ve yet to make the final selection. I was pleased to see L’Oeil de la Photographie‘s Tribute to Charles Harbutt who died last June, published today. I’ve written many times, both before his death and in on this site in an article last year written to mark his passing about his contribution to photography, concentrating on its effect on photography in the UK and on me personally. L’Oeil’s (it now prefers to be called ‘The Eye of Photography’ in ‘Anglo-Saxon’ countries, probably because many Americans have a problem with anything Frenchified other than fries) piece is short, but brings together a number of links, appears to have been prompted by the news that the Peter Fetermann gallery in Santa Monica has acquired a portion of his estate. You will find some of his pictures on their site as well as a page on his last book, Departures and Arrivals, still available new in the UK for around £20 (though you can pay up to up to £80 from some overseas booksellers.) It is better printed than his first and most influential volume, Travelog, which contains most of the better images from the later volume but now costs ten times as much. While you are on the L’Oiel site, the ‘About‘ page, which features an interview with its founder Jean-Jacques Naudet makes interesting reading. There is also now a Chinese version of L’Oeil, (is it called 作者?) though it appears to be almost entirely in English, with the exception of some titles and the occasional spot of French. You can learn more about Harbutt on some of the links cited in L’Oeil, and in those on my post last year. I’d particularly recommend the Visura portfolio, still on line though sadly the magazine is not currently being published. “You may be a photographer, but are you an artist?” is the question posed by Roger Ballen in a short video in which he gives seven thoughts about this. They are of interest, even if you are not really concerned about being an artist, certainly thinking about some of them should make you a better photographer. They may also help you understand Ballen’s work better. I’ve admired his work since I first saw it, but it has never been something that I wanted to emulate. And I think that those photographers who I’ve really admired most and who have inspired me in my own work are generally people who were more interested in what it meant to be a photographer rather than in being an artist. Thanks to Peggy Sue Amison for sharing a link to this video on Facebook. You are currently browsing the Re-photo blog archives for April, 2016.